But first McClellan outlined his curriculum and took it to the National Association of Realtors. That was over a year ago. Suguitan said the seminar was approved for two course credits toward Realtors’ annual continuing education requirements. “They also told Bruce that his program was the best realty safety course they had ever seen,” she said. 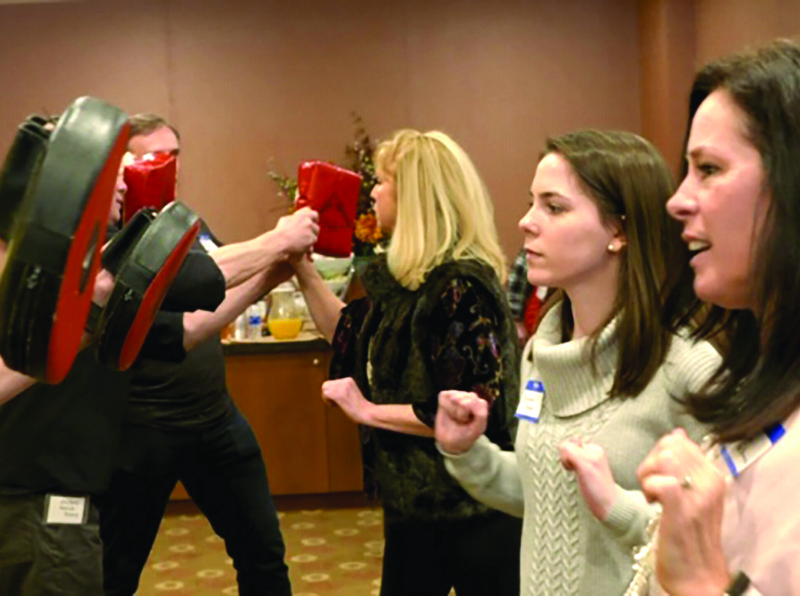 Personal Safety Services may be the only program where attendees can gain some simple self-defense skills from a seventh degree black belt. McClellan and Suguitan have had a working relationship for many years, and he called on her organizational skills and real estate background to help implement the program. Personal Safety Services was up and running in a few months. The first seminar drew 12 real estate agents through word of mouth. Meanwhile, McClellan was approaching the Greater Capital Area Association of Realtors and, thanks to GCAR’s marketing power, the next seminar in Malta in January sold out within a week, said Suguitan. Real estate agents who attend the group’s two-hour seminars can acquire an increased awareness of the kinds of safety issues they face and learn about protecting themselves on the job. Suguitan teams with Kathleen Hauser of Roohan Realty, based in Saratoga Springs, preparing and presenting the first hour of the program. The content of the second hour makes this program unlike most others, as Shihan Patrick Hussey, chief instructor and founder of the Tenkara Dojo at Saratoga Karate, conducts a hands-on session teaching a few simple self-defense moves. A former real estate agent, Hussey is in a strong position to teach practical tips so that agents, many of whom are women and often show listings alone, are prepared to ward off danger. Attendees are encouraged to practice the techniques learned at the seminar with their colleagues to stay fresh and alert. GCAR will sponsor another seminar this coming fall in Albany. McClellan has also approached Southern Adirondack Association of Realtors, which will be inviting its associates to a spring seminar set for May 15 at the Holiday Inn Express in Queensbury. The price to attend is $25.